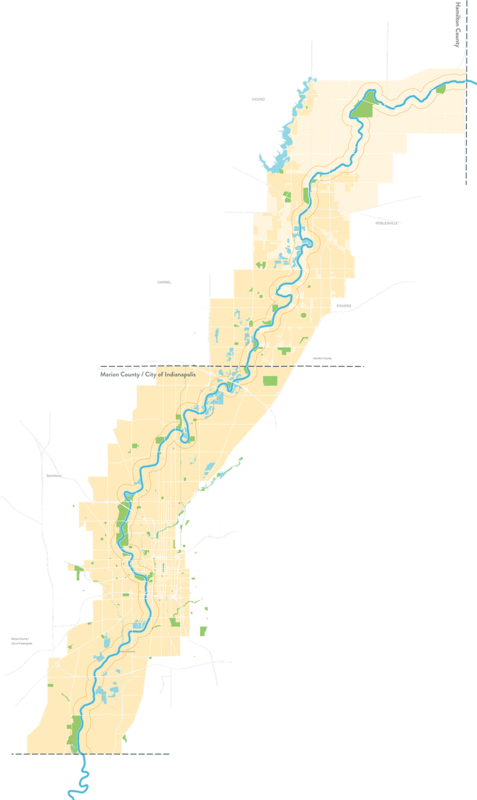 The White River flows along the entire West side of Fishers. This is a fantastic asset that has a lot more to offer than a strip of old railroad tracks. UPDATE: Due to the weather, the meetings for 1/30 at MIBOR and Sun King Brewery have been postponed to 2/13 at a location to be determined. When I’ve attended one of these events in the past, there was not a formal meeting, but rather a chance to see some of the plan and provide direct input to the group. This has included home owners asking that the plans leave their land alone to adventurers asking for more activities to be created. There are also those simply looking to understand more about what is available in the area. Indiana is known for being flat. While this isn’t totally true, in most locations it is true enough. When it comes to sledding, flat isn’t a good feature. While you can jaunt up to Noblesville and pay to sled on hills, if you live in Fishers, there is no reason to leave town. In fact, there are at least two great places to sled – one on the far West side and one on the far East side. Of course, my kids and I use the location on the East side, so while there is a desire to keep it a secret, I’ll open up and share! On the East side of Fishers is Heritage Park at White River. To get there, simply take 106th Street West until you can go no further. Once you cross Eller Road, you drive into the park. This is a relatively small park in Fishers but offers unique opportunities. 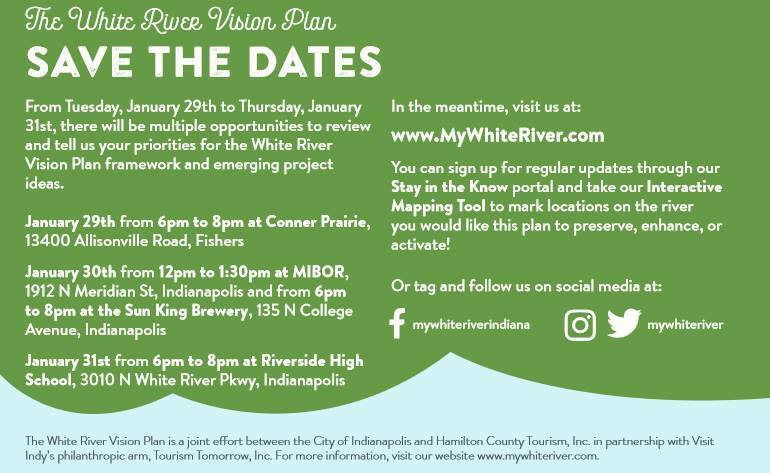 In the summer it is one of the few places in Fishers where you can get to the White River. In a future article, I’ll talk in more details about this park, however, for this article, my focus is on the most notable winter feature of this park, which is a large hill. Better yet, it’s next to a parking lot, so it is easy to get to! Heritage Park has one of the better sledding hills in town since it has a little bit of distance, but not so much that it is brutal to walk back to the top. The main part of the hill offers a longer run on a sled. Going off the right part of the hill offer a small slope that flattens out then a secondary smaller slope. This is great for the littler kids learning to sled as well as for those that try using snow boards instead of sled. 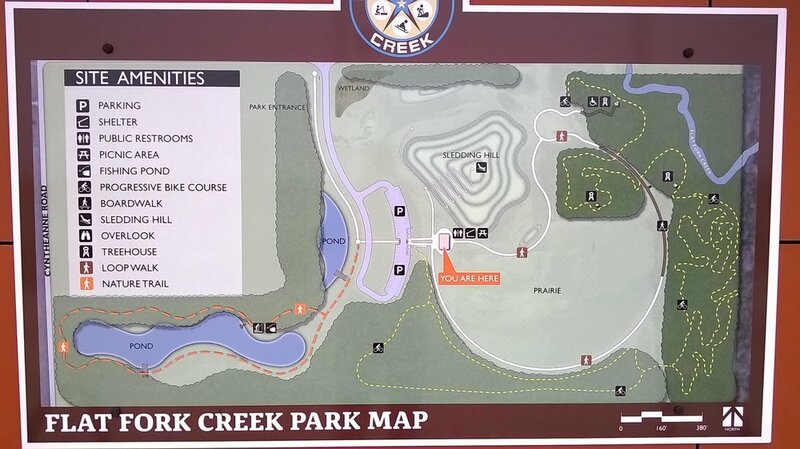 The other sledding part in Fishers is Flat Fork Creek Park, which is on the far East side of Fishers. This park claims the tallest hill in Hamilton County. It is located at 101st Street and Cyntheanne Road. 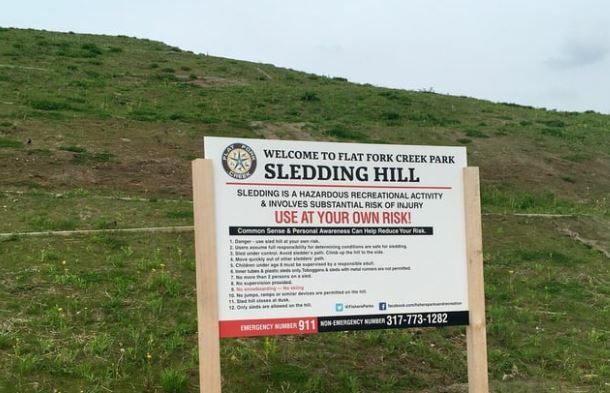 While I’ve not used the sledding hill at Flat Fork Creek, many have. The City of Fishers highlighted it this past week-end with the advent of the first good snow of the winter. One nice thing about this 60-foot sledding hill is that it is ADA compliant. Of course, as more people learn about these two great locations, they will get more crowded. As such, care should be used, and the city rules should be followed. These rules include no metal sleds or kayaks. Also included in the rules are that you should not sled on designated walking paths. Granted, at Heritage Park you will be going over one of the snow-covered paths! The most important rule is that you should look uphill and yield to others coming down. “Bowling for People” is not an allowed activity! Of course, the most important rule is to have fun. It is critical to note, however, that this rule applies to grown-ups as much as kids. While I might look silly, I find sledding to be as much fun as my kids. While parents are free to stand around at the top of the hills and chat, they really can have a lot of fun hopping on a sled as well! With more snow coming this week-end, I expect I might see a few of you at the hills!